Best Buy in Ocala Downs. Gated Community with horse trails. This hits all the bases. Huge floor plan with an open kitchen, wrap around fireplace. 4/3 plus office. Upgraded cabinetry that was recently installed in the kitchen and bath remodel. Newer Stainless Appliances, air conditioner and hot water heater, Salt Water Pool and a whole house generator. 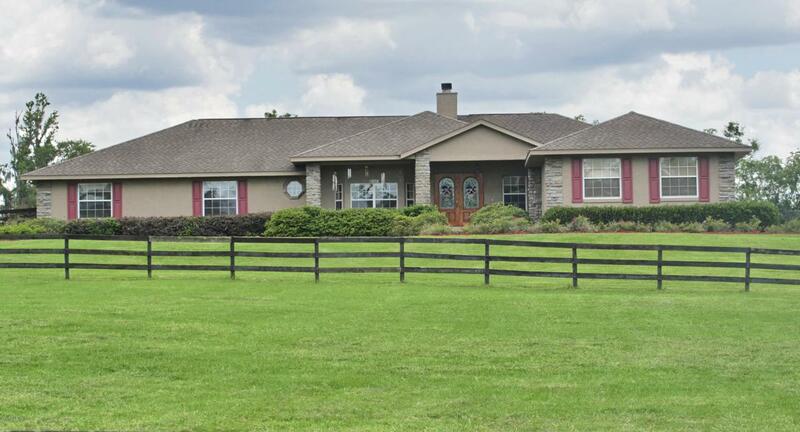 Lovely 3 stall barn with fans/lights and tack room, 3 large run in sheds and several paddocks. The interior has been updated with neutral color paint. Tons of walk in closets and linen closets in every bathroom. Long term horse boarding. Driving and riding trails. Premiere Equestrian community. HOA allows 3 buildings per site so building a large barn can be an option. INCOME PRODUCING with retired horses. $20,000 Barn allowance or make offer. Listing provided courtesy of Kim Davis of Kim Davis Realty.